A group of mercenaries is hired to infiltrate a South American country and overthrow its ruthless dictator. Once the mission begins, the men realize things aren't quite as they appear, finding themselves caught in a dangerous web of deceit and betrayal. With their mission thwarted and an innocent life in danger, the men struggle with an even tougher challenge -- one that threatens to destroy this band of brothers. Barney Ross is a man with nothing to lose. Fearless and void of emotion, he is the leader, the sage and the strategist of this tight-knit band of men who live on the fringe. His only attachment is to his pickup truck, his seaplane and his team of loyal modern-day warriors. His is a true cynic who describes what he does as "removing those hard to get at stains." 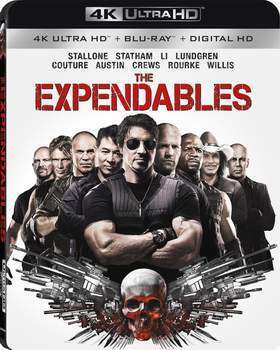 The team behind him is made up of Lee Christmas, former SAS and a savant with anything that has a blade; Yin Yang, a master at close-quarter combat; Hale Caesar, who has known Barney for ten years and is a long-barrel weapons specialist; Toll Road, a skilled demolitions expert and considered the intellect of the group; and Gunnar Jensen, a combat veteran and an expert in precision sniping who struggles with his own demons. When the mysterious Church offers Barney a job no one else would take, Barney and his team embark on what appears to be a routine mission: overthrow General Gaza, the murderous dictator of the small island country of Vilena and end the years of death and destruction inflicted on its people. On a reconnaissance mission to Vilena, Barney and Christmas meet their contact Sandra, a local freedom-fighter with a dark secret. They also come to learn who their true enemy is: rogue ex-CIA operative James Monroe and his henchman Paine. When things go terribly wrong, Barney and Christmas are forced to leave Sandra behind, essentially giving her a death sentence. Haunted by this failure, Barney convinces the team to return to Vilena to rescue the hostage and finish the job he started. And to perhaps save a soul: his own.